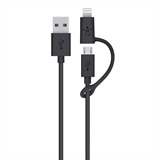 Charge and sync your Micro-USB devices as well as Lightning connector devices using just one cable. Simply plug the USB end directly into any USB port to charge and sync rapidly and safely. 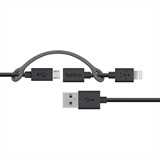 Use the 3-foot Micro-USB to USB Cable to charge and sync your Samsung Galaxy S® 4, Galaxy S® III, Galaxy S® II, or Galaxy Note® II Smartphone at the fastest possible speed. The small, durable Micro-USB connector also works with most smartphones and tablets with a Micro-USB port, including Samsung, Kindle, HTC, Nokia, LG, Nexus and Motorola. 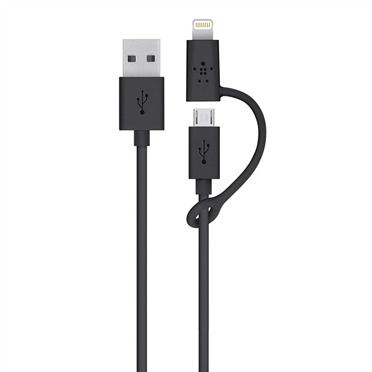 Use the Lightning connector to adapter to charge your iPhone 5, iPod touch (5th generation) iPad with Retina Display (4th generation), or iPad mini at the fastest possible speed. The smaller, more durable Lightning connector is also reversible, which makes plugging it in easier than ever. The Micro-USB to USB Cable plugs into any USB 2.0 port, so you can use it virtually anywhere. Connect to your laptop to charge and sync, use your own wall charger to charge from the wall, or plug into a car charger and charge on the road. Great as a replacement cable or if you simply need an extra.